According to the most recent MAP (minimum advertised price) list from Verizon, a handful of popular DROID phones will see a discount tomorrow morning. The most interesting of them all is the DROID 4 which has still not been given a public release date. During CES week, we saw the price first appear on this list at $249, but if this new list holds up, we could see the device launch at just $199 on 2-year contract. I’d call that a deal knowing that this phone is the world’s thinnest and probably most powerful 4G LTE slider. You can view our hands-on with the device here. Along with the D4 price drop, the Bionic should fall to $149 and both white and black 32GB DROID RAZR models should come in at $279. 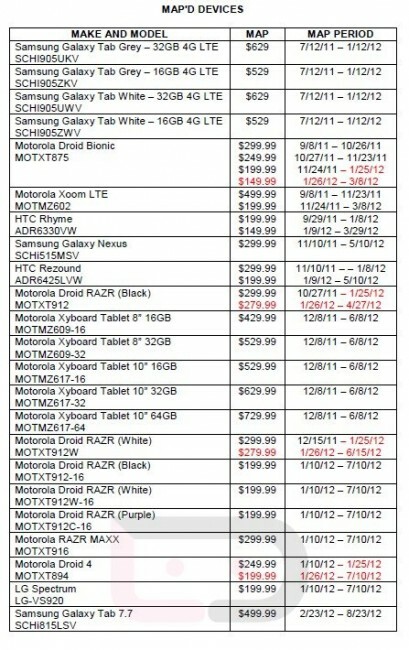 So not only is tomorrow DROID RAZR MAXX launch day, but you can score some deals at Verizon on a variety of other phones. Wednesday Poll: First Accessory You Buy After Getting a New Phone?